In the Arabic language, there are diacritics [including the fat-ha, dhammah and kasrah] that can be the reason a word’s meaning changes completely. One of these diacritics is the shaddah. Insha Allah I will briefly explain what this is and move on to the Tajweed rule regarding the Noon and Meem letters that have a shaddah. The second letter has a respective diacritic, fat-ha, dammah, or kasrah. To briefly explain the colour code. The light green is where the doubling of the letter occurs. The darker green is the respective diacritic that follows the doubling. Now that the shaddah is down-pat understood, the Tajweed rule regarding the shaddah is as follows. For every noon and meem mushaddad, i.e. for every noon and meem that have a shaddah, one must sound a ghunnah. This rule in Arabic is called, ghunnat noon/meem mushaddadah. It is the simplest rule, because you just need to check, does the noon/meem have a shaddah on top? If so, sound a ghunnah. And it’s as simple as that! This Tajweed rule is complete! Where you see a shaddah on a meem or noon, just do a ghunnah. As I mentioned, diacritics have the ability to change the entire meaning of a word/sentence. I don’t like to just say things, so let’s prove it. Darrasa means “he taught”. Very simple, very big difference. One more example. This sentence means “a boy cried”. Adding another two shaddah causes two things, letters alif and laam to be added making the boy an object being pointed to, and the meaning to change. Which means “[he] made the boy cry”. Later you will come to realise that not only do diacritics change the meaning of things, but so does the pronunciation of a letter. As for Tajweed, just remember shaddah + meem or noon = ghunnah. Merging things together can be heaps of fun. I tend to enjoy combining colours together to create new, fascinating ones. The fourth rule for Al-Noon Al-Saakinah is all about merging/combining. This rule is said to be one of the most complicated rules. But there is nothing to fret about because practice makes perfect, insha Allah. Let’s start with what ghunnah means. Ghunnah: A ghunnah is the sound made entirely by the nose [this is in regards to the sounds coming from the mouth]. This completes the first level of the diagram when following the rightmost arrow. follow a Noon Saakinah or Tanween. Now the leftmost arrow of the first level of the diagram is complete. [i.e. the entire first level is now complete]. With these two letters, raa and laam, their idghaam is called: idghaam bila ghunnah kaamel, or in English, merging without ghunnah fully. Here the “nn” sound from the Tanween or Noon Saakinah is completely eliminated and the laam or raa are said straight away without any emphasis on their sounds. Hence why the “fully” is added onto the end – i.e. noting that the “nn” sound is “fully” wiped out. Notice the two green letters are now the place where the two words are connected without the Tanween. Some students [and I know quite a few] have trouble in the beginning trying to connect two words without the “nn” sound in between. They end up “leaning on” the laam or raa and saying them as though there is a shaddah on these two letters. However there isn’t. But here you may protest that in fact there is. Look at the example above. There is a shaddah on the laam in both cases for the words likulli and lumazah. This shaddah is not there for shaddah purposes. It has been put there as a notice to the reader that the Tanween (or Noon Saakinah) is not to be pronounced at all, not even through the nasal passage. Below is a second example using a Noon Saakinah. While I still have your attention [I hope], and avoiding any confusion possible, insha Allah, I’ll continue on with the rightmost arrow, merging with ghunnah. are to be said with a “lesser idgham bi ghunnah“. 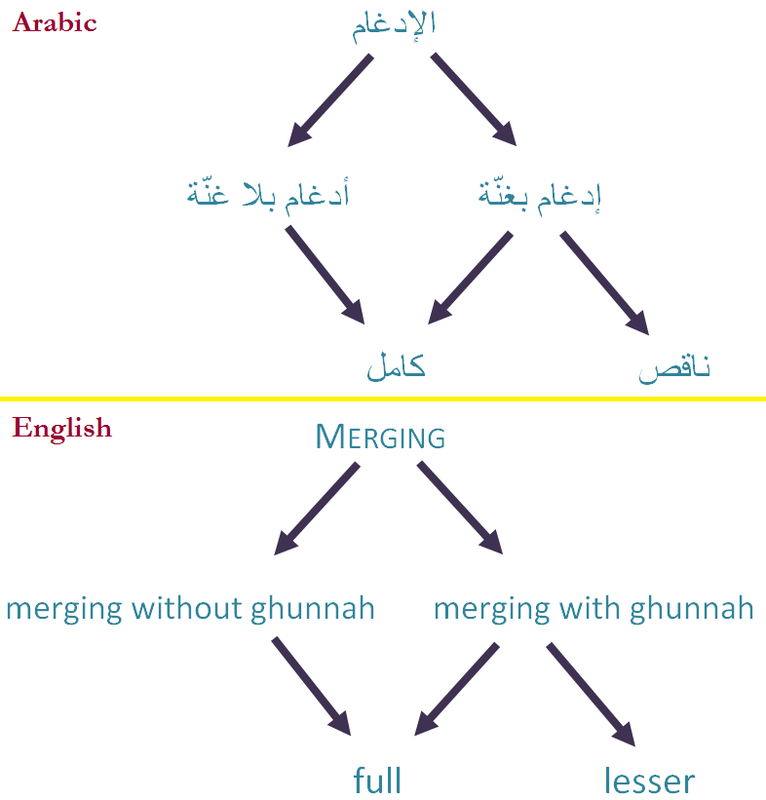 Idgham bi ghunnah, whether fuller or lesser is sounded for two counts, similar to the time it takes to say the words, “one – two”. Notice here the shaddah on the first laam is to note the ruling of idghaam bila ghunnah kaamel. The second shaddah however is there for shaddah purposes. You are to “double” the sound of the second laam so it is said as I’ve written above, lil-latheena. Idghaam is something I find very beautiful. It’s adds a tremendous tone to recitation and I think it, alongside the rule regarding noon and meem mushadadah, adds a very serene and tranquil sensation for the both listener and reader. What’s that rule I just mentioned? Keep an eye out for new posts. – Shaddah: is to double the sound of a letter so that it is stressed. Such a letter is said to be mushaddad.